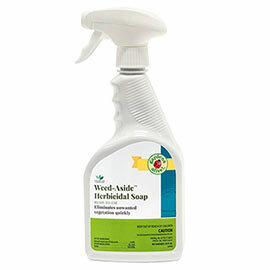 Weed-Aside Herbicidal Soap - Gardens Alive! 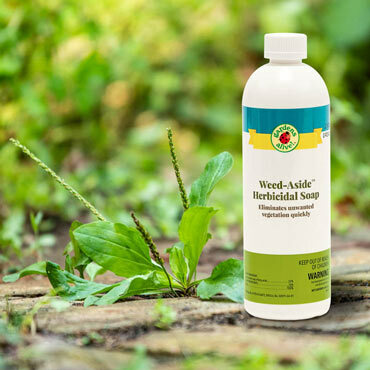 Remove unwanted weeds, grass, algae and moss from your garden with Weed-Aside™ Herbicidal Soap, an eco-friendly, concentrated solution that comes in 16- or 32-oz bottles. Weed-Aside will never contain harmful metal salts such as iron or zinc. It's perfect for use on weeds in vegetable and flower gardens, around fruit trees, and on sidewalks, fences and driveways. Weed-Aside does not stain concrete, and is most effective when used on weeds less than 5" high. Catch them early and often! It's effective on dandelions, stinkweed, thistle, chickweed, corn spurry, sheep sorrel, annual bluegrass, and many more! See the included information sheet for details about the full range of weeds, moss, and lichen.